This 15th century fortified urban tower house is located inside the old town walls. It may have belonged to the Hospital of St John the Baptist in Dublin, one of the crusading orders. The last the Prior of the Hospital was a Thomas Everard who returned to Fethard and was granted the right to hold 'Court Leet'. 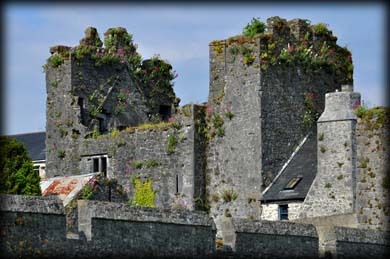 Everard may have held court in Fethard Castle twice annually and this is probably where the name Court Castle was derived. The entrance to the castle was in the west wall. The large doorway in the east wall, pictured above were a later addition. The mullioned windows in the east wall are blocked up but the hood moulding is still visible. 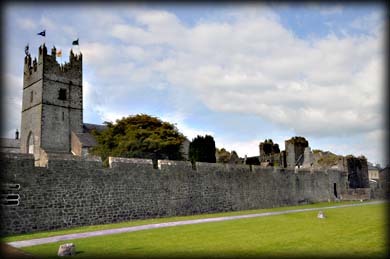 Situated: Court Castle is located on Watergate Street in the centre of the town. From Main Street head east on the R692 turing right onto Watergate Street at the Square. Discovery Map 67: S 2079 3494. Last visit June 2015.